For the group presentation project, my team explored the architectural rendering engines of Maya, Rhino, 3DS Max, and Revit. In our studies, we hoped to discover the strengths of each program and how they function. This is an exciting and applicable topic because of the appeal of high-quality renderings in both the academic and professional arenas. The availability of these powerful rendering engines offers us as students the means to quickly produce stunning images with minimal photoshopping. This is a highly marketable skill to firms looking to inexpensively churn out “money shot” renderings for both client presentations and competition entries. In approaching the subject, our team of six agreed to establish a simple scene: a wooden cube and aluminum sphere both sitting on a concrete plane. We determined a common camera position and utilized each of the four programs to render the scene. See results attached. All the programs had similar interfaces and editing features, so we researched some of the differences between the engines. We took the opportunity to explore each engines main strengths and weaknesses. For one, Maya is strong in creating animations. In fact, it is used for many high-quality graphic video games and animated films, including Walt Disney’s Dinosaur from 2000. Many users on online forums, however, mention it having a lack of features compared to other rendering software programs. It is also said that it cannot motion blur and is slow for large projects because of its capability to create many different light sources. In rendering with Rhino, a favorite of its features was its ability to contribute post-process effects. This includes adjustments to elements such as depth of field, exposure, focal blur, and glare, offering the options to depict scenes in a similar manner that a camera would. Another strength of Rhino is its compatibility with a plethora of plug-ins including V-Ray for rendering. Next, we took a look at 3DS Max which features Mental Ray rendering, an application developed by Mental Images. Users online generally agree that Mental Ray is more powerful than V-Ray for rendering, in part because of its many shading capabilities. However, they argue that V-Ray is more practical for most users because it is less complex. It renders more quickly because of smaller file sizes and is still powerful enough for most applications. Finally, we explore Revit. Revit 2013 features a real-time ray trace render style now, on top of both Mental Ray and cloud rendering. The ray trace feature allows the user to orbit around and through a scene as it renders in real-time. The user can make the rendering continue by halting movement, or stop the rendering by clicking in the view. The real-time option is exciting yet causes the model to drag considerably if it is too much for the processor to handle. Overall, each program has its own pros and cons, and I am excited about the potential of each. However, since each is so strong in graphic output, I will still likely choose my platform for each project based on its modeling capabilities with respect to my design intentions, rather than on its rendering capabilities. Inspired by the exposed trusses in the Niehoff space as well as the restriction of coordinating our cloud design with the tube lighting overhead, we are beginning this project with the idea of incorporating a partially translucent space truss. Attached are a few different iterations we’re working with via Maya. 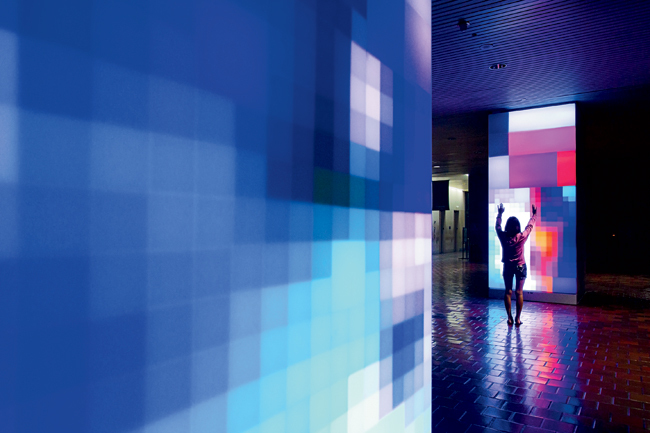 In the lobby of Miami’s Stephen P. Clark Government Center, columns adorned with light boxes imitate pedestrian movement with “video paintings.” This permanent installation, titled Reflect by artist Ivan Toth Depeña, is comprised of 6-inch deep steel boxes, outfitted with LED lights and wired to specialty motion-sensor cameras tracking both movements and forms of passersby. The movement is precisely analyzed and assigned color values on an RGB scale in real time, so the effect is immediate and recognizable. While the hardwiring of this project is certainly more advanced than what this project’s time frame and our skill levels allow, the concept is inspiring. To create a piece that responds to current and/or past viewers’ actions/thoughts/initiatives/culture is an interesting angle. This project also takes on a simple form with an easily-fabricated module, which would be a practical approach to the Niehoff installation project.